Hi friends! So blogging the last two weeks hasn't happened for me. I've been knee deep in anything and everything else and sadly blogging was pushed to the back burner. 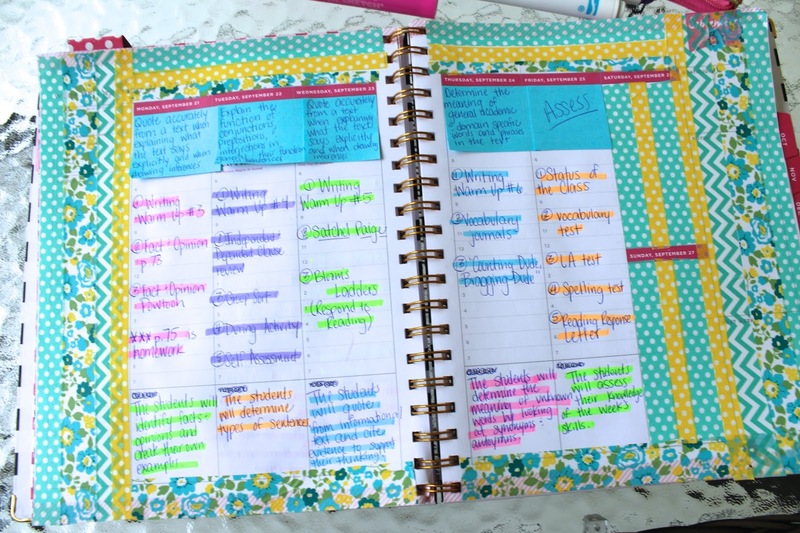 I'm back today to share with y'all my visual plans for this week and last week since I missed last Sunday's post! Let me apologize in advance for the poor pictures. I photographed outside on a yucky, rainy, sunless day and the pictures aren't the greatest! As you can see, we had a teacher work day last Wednesday and this completely messed up my week! I felt rushed all week and I feel like we didn't get to half of the stuff we needed to! Our comprehension was figurative language. We used a Nearpod that I made last year and you can find here. 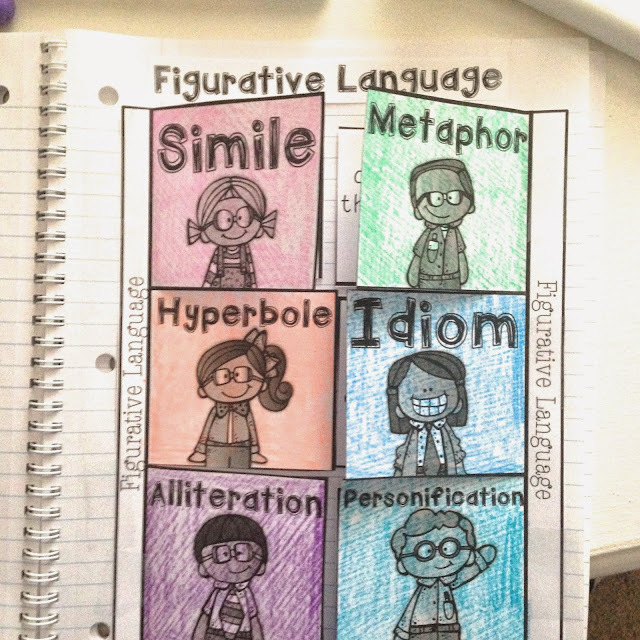 We also created this foldable to use as a study guide for a little quiz on the types of figurative language. 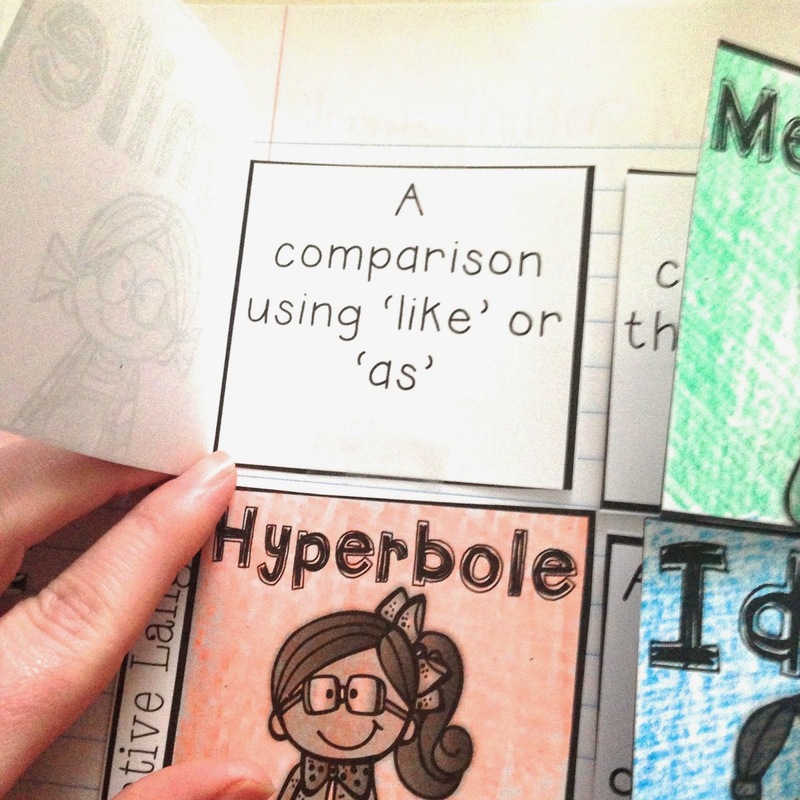 You can find this activity and more in my Teaching Figurative Language unit. We covered Independent and Dependent Clauses in Language Arts and I was thrilled with how well my kids did! We played SLIDE and did a group sort before self assessing. You can find these printables in my Strategic Teaching Lesson for Independent and Dependent Clauses. I've also bundled all 8 lessons for the first nine weeks, which you can find here. We were suppose to complete the story elements foldable two weeks, but didn't have time so we finally got to it last week. I had my kids watch this video from Flocabulary everyday as their warmup and then we had a quiz at the end of the week. I LOVE this little video and so did the kids! Flocabulary is a fabulous resource. You have to pay for it, but they have several videos free on Youtube and this one was free! You can check out their Youtube channel here. I also had the kids create a Powtoon presentation that contained a situation that had a fact or opinion in it. Powtoon is an online animated video presentation tool that is so fun! I made ones for certain idioms last year and I often have the kids use it during a unit of study. It's creative and allows them to access those higher order thinking skills! 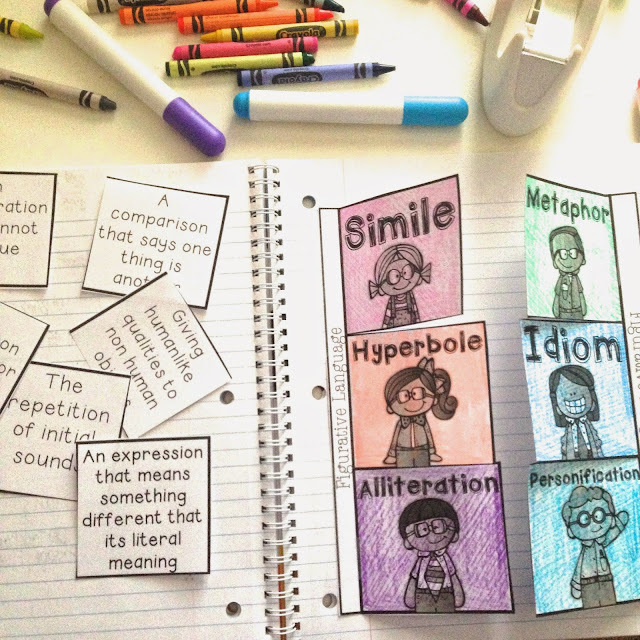 Tomorrow is all about simple, compound, and complex sentences. I'm *hoping* this goes well because they did so good with independent and dependent clauses last week! You can find my Strategic Teaching Lesson on Simple, Compound, and Complex Sentences here. Wednesday we are reading the weekly story and using my Bloom's Ladders to respond to reading. You can find my best seller here. 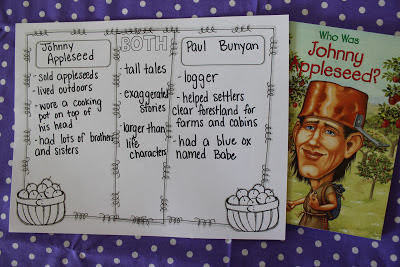 For small groups, we are starting Who Was Johnny Appleseed? You can find my guided reading activities for this book here. 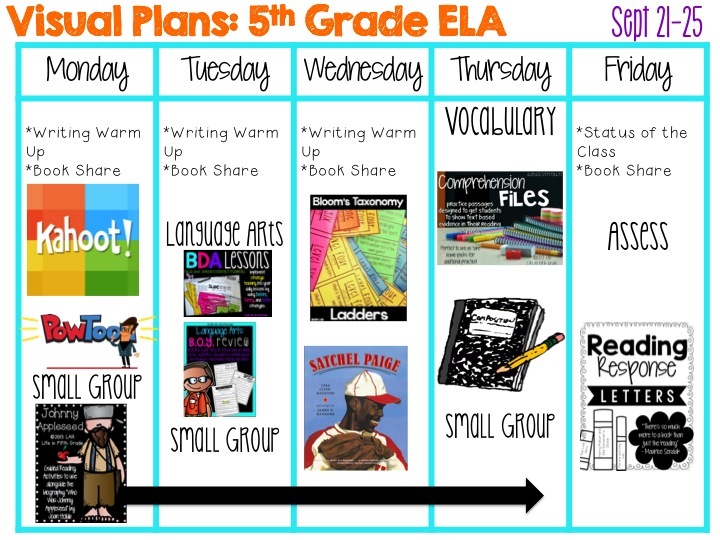 Here's the week's visual plans! Comp Files (Aug/Sept) ***October will be posted this weekend! WOW Thanks for sharing and all the links to fabulous products! I teach second grade but I still love your website and Instagram account. You always have great ideas that can be used in multi grades. I was wondering how do you keep track of grades? This is been a struggle that I would love to hear your thoughts! Thanks for sharing your lesson plan book - It's always helpful to be able to see ideas from other teachers!